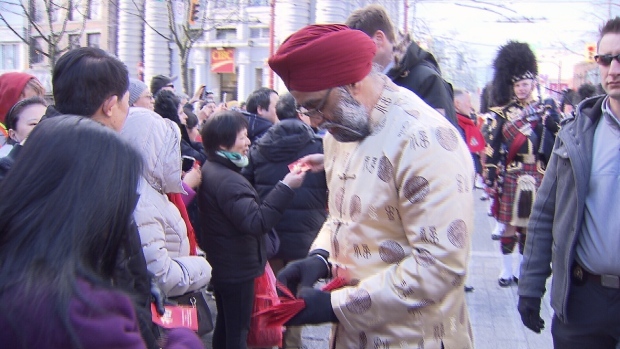 Vancouverites hit the streets of Chinatown Sunday to ring in the Year of the Pig. The 46th Annual Vancouver Chinatown Spring Festival Parade drew thousands of spectators on a cold, but colourful, afternoon. The annual event celebrates the Chinese New Year while showcasing traditional lion dancing, music and martial arts. “Today is the spring festival,” said Vancouver resident Wen Xiu Yu. “We are so happy"
“All walks of life are here, that's what makes Canada great,” explained Federal Defence Minister Harjit Sajjan, who took part in the parade. Many were bundled up and huddled together to stay warm, smiling and waving as the parade went by. Four-year-old Meshach wasn't part of the parade at first but joined in on the traditional lion dancing. “He's been practicing like all year and he welcomes grandma to the house with it every week when she comes to visit," explained his dad Simeon Pang.